Jacob Rigolet - a soon-to-be former assistant to a wealthy art collector - looks up from his seat at an auction to see his mother, the former head librarian at the Halifax Free Library, walking almost casually up the aisle. Before a stunned audience, she flings an open jar of black ink at master photographer Robert Capa's Death on a Leipzig Balcony. What's more, Jacob's police detective fiancée, Martha Crauchet, is assigned to the ensuing interrogation. 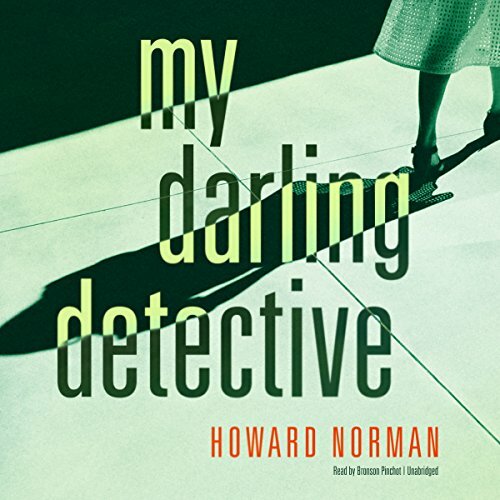 In My Darling Detective, Howard Norman delivers a fond nod to classic noir, as Jacob's understanding of the man he has always assumed to be his father unravels against the darker truth of Robert Emil, a Halifax police officer suspected but never convicted of murdering two Jewish residents during the shocking upswing of anti-Semitism in 1945. The denouement, involving a dire shootout and an emergency delivery - the second Rigolet to be born in the Halifax Free Library - is Norman at his provocative, uncannily moving best. ©2017 Howard Norman (P)2017 Blackstone Audio, Inc. This novel was a good listen for a summer drive to the beach. Whimsical characters, amusing dialog, a little suspense. The plot didn’t make much sense, but I learned something about fine arts auctions, library science, radio mysteries, Halifax and the photography of Robert Capa. Bronson Pinchot is often a strong narrator, but here I felt like he was disengaged. His voice took on some excitement and character when the plot grew suspenseful, but too often he spoke in a dry monotone, perhaps impersonating a 1940s detective. A strange story that I lost interest in. Its not really a mystery. I read it because of a positive review. The beginning was interesting but there are a lot of dead ends in the story. Perhaps the author has potential but this book fails to meet it. The narrator's attempts to speak for female characters did not work and the whole story was low energy. I chose for the Nova Scotia location as will be traveling there soon. And being a former librarian and art appreciator really liked the setting of libraries and the 70s vibe ( including tv and music of the time- fun !) with a historical WWll references. Lots of unusual elements for the mystery. better listened to than read and I've done both! Where does My Darling Detective rank among all the audiobooks you’ve listened to so far? What was one of the most memorable moments of My Darling Detective? so many great scenes, hard to pick one. Loved the Nova Scotia setting. Made me want to go there and visit libraries, much more interesting than my local! Wrong pronunciation of Dalhousie University. Reader did a great job but should have checked on proper pronunciation of Dalhousie University. It's pronounced "Dal-HOW-Sie. NOT Dal-Who-Sie. Very annoying as he repeats the incorrect pronunciation constantly. Otherwise, loved listening to his reading. This book is an example of why I used to read a book a week and now listen to 2 or more. Delightful. Loved the book but was disappointed in lack of specificity regarding the death of former detective Emil.